Did you now that 2016 is the year of the pulses? Me neither until recently! 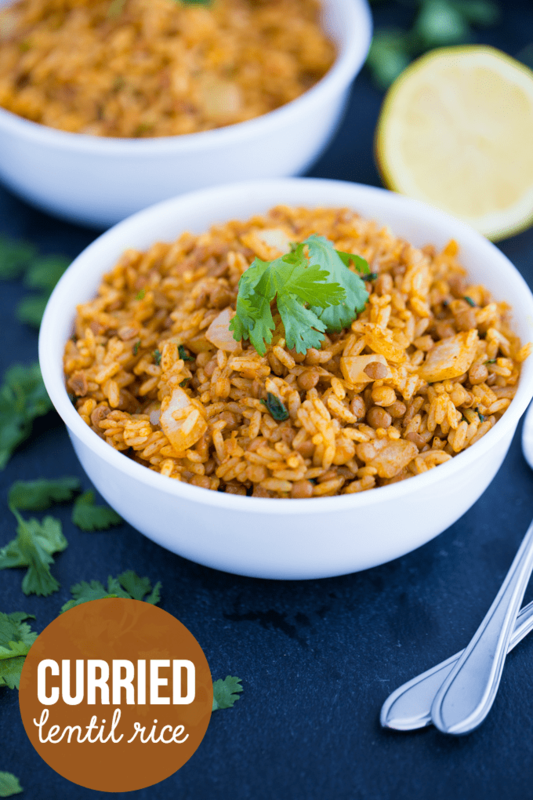 Maybe it’s a sign I should add more pulses to our meals like this easy recipe for Curried Lentil Rice? They are healthy with lots of fibre and protein and can be used in a variety of interesting ways. The word “pulse” comes from the Latin “puls” and are the edible seeds of plants in the legume family. 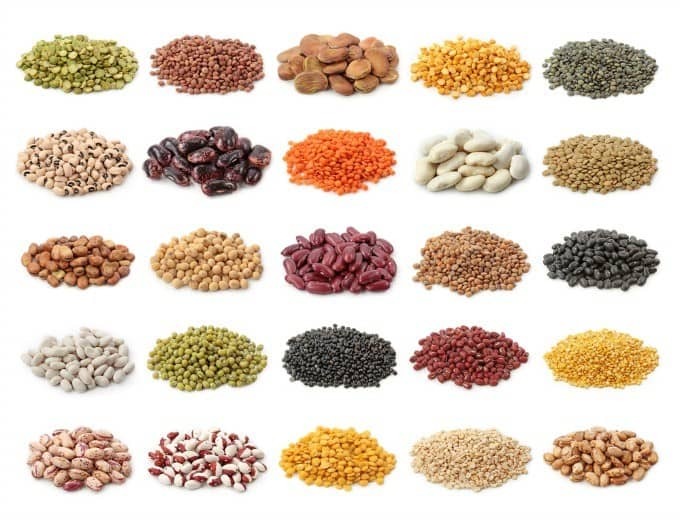 Some examples of pulses include chickpeas, green split peas, aduki beans, mung beans, red lentils, green lentils, black eyed peas, kidney beans, yellow split peas, soya beans, pinto beans, black turtle beans and many more. The pulse I’m most familiar with is green lentils. I often serve a can of cooked lentils as a side dish to our meals. Another recipe I’ve been making for years is Lentil Rice. Our old neighbour in Petawawa made a batch and I was surprised how delicious it was. I think that was my first experience with lentils. I asked her for the recipe and have been making it regularly for 17+ years! The Cultured Kitchen March challenge was to create a recipe with a pulse of my choosing. I decided to “Mix in a little India” in an old favourite, Lentil Rice. The result was fabulous. I may even like this version better than the original! I’m calling this recipe, Curried Lentil Rice. I used Patak’s Hot Curry Paste to make it extra spicy. If you don’t like spicy dishes, use Patak’s Mild Curry Paste instead. This recipe makes an excellent side for chicken or beef. I ended up eating a bowl of it on its own for lunch. It’s great for a Meatless Monday too. The longest part of the preparation is cooking the rice. I used converted white rice which takes about 20 minutes to cook. Save on time by using instant rice if you prefer. I also like to saute the onions and garlic for a few minutes to soften them and tone down the strong flavours. I heat the lentils up in a small saucepan too, but you can use them straight out of the can if you like. I prefer them to be heated up a bit. The curry paste adds a beautiful and vibrant orange colour to the dish. This is a great recipe to add some extra fibre and protein to your family’s diet. You might also like my Warm Lentil Salad. What are your favourite pulses? Connect with Patak’s Canada on Facebook and Twitter. Vibrant, spicy and healthy! This delicious side dish is perfect for a Meatless Monday or to serve with some chicken for a hearty meal. Heat lentils in a small saucepan over medium low heat. Set aside. Add olive oil to a skillet and saute onions and garlic for 3 to 4 minutes, until softened. 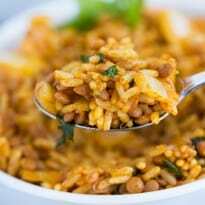 In a large bowl, combine cooked rice, lentils, cooked onions and garlic, Patak’s Hot Curry Paste, cilantro and lemon juice. Stir. Serve hot. Disclosure: I am part of The Cultured Kitchen Ambassador program in partnership with Patak’s Canada and Blue Dragon Canada and I received special perks as part of my affiliation with this group. The opinions on this blog are my own. That sounds phenomenal. We’re big on rice in our house, so I will definitely be trying this. This looks delicious. Lentils and beans are so under appreciated! I eat them most days – my current favourite is a spiced cinnamon lentil stew (https://alwaysaddcinnamon.wordpress.com/2014/05/29/cinnamon-lentil-stew/) or a kidney bean curry. Looks good. We are trying to eat more beans & lentils so any new recipes that use them are great! We love curry at my house and this is such a healthy recipe and I would love to make it as a nice Spring side dish. Thanks for sharing! We love rice and eat it quite a bit. 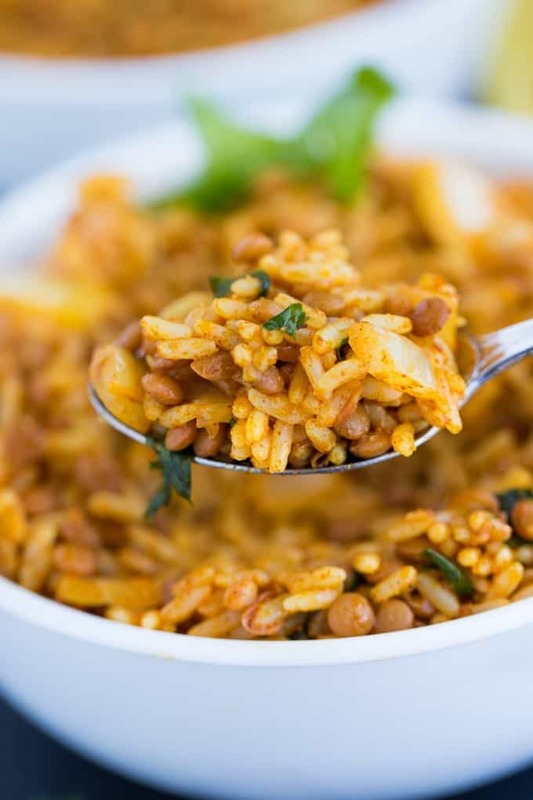 Adding lentils and curry sounds like an interesting twist to our side dish. I bet my family will like this a lot! This looks really good. You mentioned that you soften up the onions to help reduce the strong flavor, so my question is: does the curry overwhelm the senses or is it a more subtle flavor that enhances the rest of the meal? This recipe looks amazing! I absolutely love eating rice! I will definitely be making this sometime soon. My entire family would love it! I’ve never even heard of curried lentil rice. But oh my goodness, it looks amazing!!! What a tasty and healthy dish. My family has always eaten beans. We’re from the south, so beans are a staple. I just recently heard about how healthy lentils are. I’ll definitely be serving this up soon. I love the nutritional value that you get when you add things like lentils to a dish. Also a BIG fan of curry. This recipe looks fabulous. We love all things curry! also big fans of Patak’s! I have never tried curry or lentils! This is one of them recipes that I better make soon to kill two birds with one stone. I have never heard of this combination before!! What a great way to dress up rice for dinner, I need to try out this recipe! This looks so delicious and easy to make. I will have to try it on the weekend. Lentils are so delicious to cook with. I must admit, I have never had curry. This rice looks amazing. I think I must try this recipe! I was looking for a new curry recipe, and I can count on my kids eating rice anytime. This looks delicious! My husband loves rice in curry dishes! I have to make this for him! Yummy! It looks so tempting, I would like to try your fantastic recipe for my family. They would love it for sure. WOW! What an informative post! I love how you explained pulses – I had no idea. And the recipe looks AMAZING! Thanks! That sounds and looks fabulous! Thanks for sharing! I love rice dishes! This is one that I will have to give a try to go with my meals. This recipe looks so good – I will have to try it. I love curry, lentils and rice, so this was got pinned by me! Can’t wait to try it–thanks! This sounds delicious (minus the cilantro – yes, I’m one of those). I have an Instant Pot and I’ll bet I could cook dried lentils and rice together in it. I’m going to give it a try. I followed you here from the Wednesday Blog Hop hosted on Tornadough Alli’s site. I hope you’ll visit me at Life With Dee. Have a beautiful day. This looks delicious. I will have to try it on our next beans and rice night. I’m loving this recipe! It’s such an easy and flavorful dish. 🙂 It’s great how easily it can be customized too! 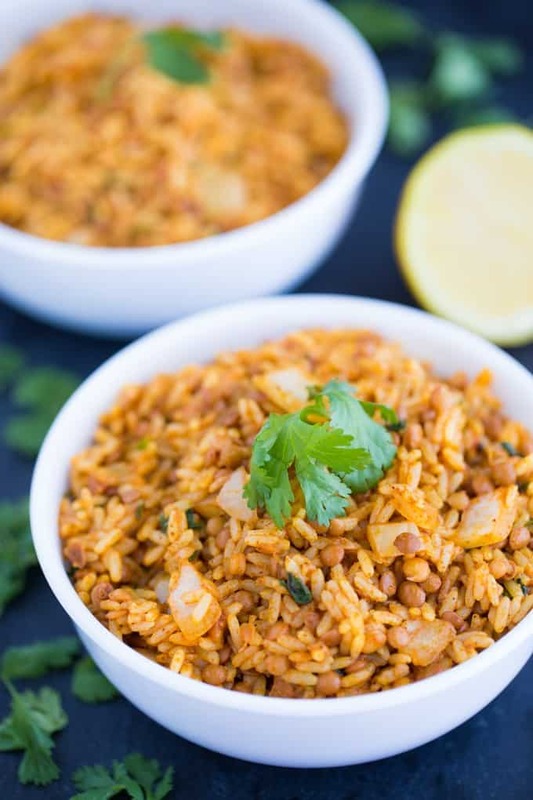 I DO love spicy dishes and I’m always looking for new ways to serve lentils – love them but have just recently started using them – so this completely hits the spot! 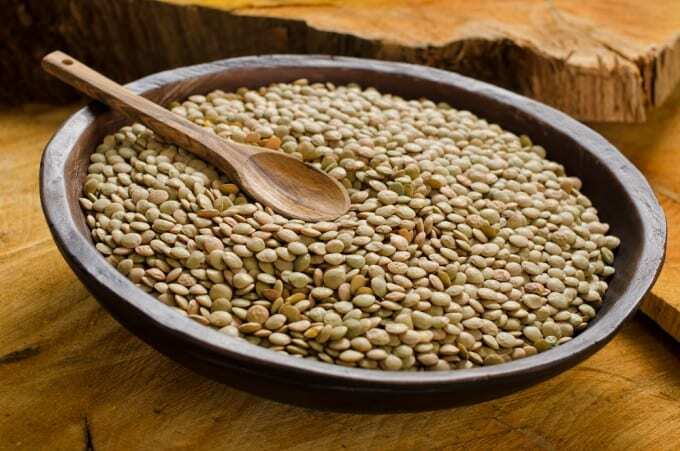 Our Mediterranean culture is still well known for eating healthy foods, and pulses are among them. I love all of them, and together with that rice seems delicious! This looks great. We are big lovers of lentils and rice around here so we’ll try it soon! I was looking for a post of how to do this without the paste. I have the basic Indian spices, so some portions of them instead of the paste would be helpful to folks living elsewhere in the world. If no one can give me some ball park amounts of curry, etc. I guess it is experimentation time.